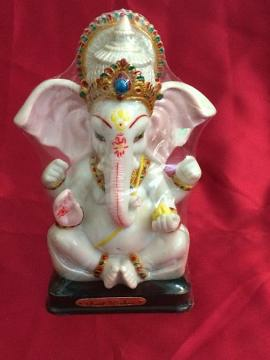 This beautifully decorated statue of Ganesha looks like marble but is made from premium quality plastic. Ideal as a gift or for your own home. Buy Decorated White, Gold & Pink Ganesha Sculpture, sold & shipped by Yaadein where you can shop online for Pooja Samagri, Hindu Statues, Puja Items, Religious Gifts & Home Decor. This Idols & Statues collection has been tagged as hindu religion, ganpati bappa idol, traditional wedding housewarming return gift, religious gift.